Neelam Realtors is one of the Mumbai's premier real estate developers since 1978. With more than 20 partners for building solutions, the group endeavors to create premium quality residential and commercial landmarks within the Mumbai Metropolitan Region. In modern age of technology, Neelam Realtors required a cost-effective solution for seamless connectivity between their field workers and head office. Partner OBM Automation PVT. Ltd.
Mumbai is witnessing a vigorous growth in real estate and Neelam Realtors is blooming along it. With high mobility of the workforce and project-based nature of the industry, thrives the need for wireless connectivity and seamless integration with sites and field workers. Moreover, Neelam Realtors required to keep their existing communication system intact with a new cost-effective system in place for mobile workers. Matrix and its channel partner OBM Automation PVT. Ltd. jointly offered an IP-PBX – ETERNITY PE with SPARSH M2S – Mobile Softphone as a business mobility solution for seamless connectivity with speed. ETERNITY PE is a cost-effective SMB IP-PBX for Futuristic Businesses with Scalable Platform and universal connectivity that can be flexibly configured, expanded and centrally managed to address specific communication needs. Moreover, SPARSH M2S is a mobile softphone application for Android/iPhone smartphones that redefines the Workplace Experience for Matrix IP-PBX Users. It delivers one touch access to advance call management features of Matrix IP-PBX system such as call conference, presence, corporate directory access, voice mail and many more. Using IP telephony of VoIP network, Neelam Realtors reduced the telecom cost on every call made between Head Office and Field Workers up to 80%. With flexible scalability and minimum investment, IP telephony features of ETERNITY PE offers simple 3-digit dialing, conference, call transfer and other call management features bringing diversity to solutions and making it an easy choice for customer. 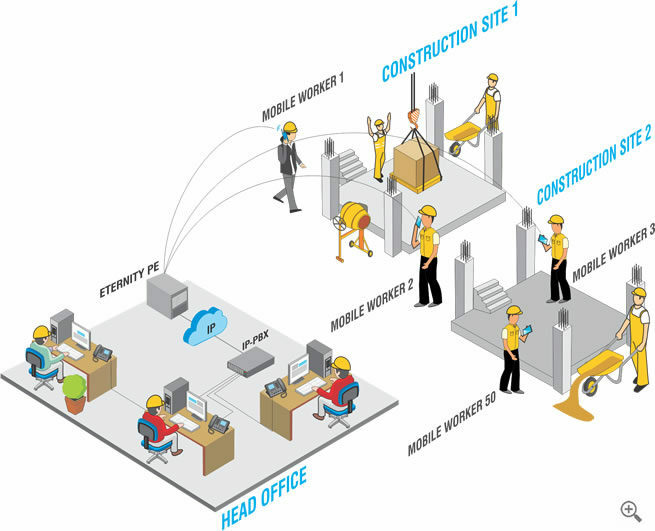 Business Mobility solution from SPARSH M2S – Mobile Softphone empowered the Field Workers to have one-touch access to co-workers in Head Office by simply Dial-by-Extension or Corporate Directory Access making them virtually present at the desk. Moreover, Enhanced collaboration with video calling, instant messaging, presence sharing and voice mail features redefines the Workplace Experience. With the help of IP network, existing IP-PBX and ETRNITY PE were connected for expansion of the system without drastically changing the infrastructure. This helped Neelam Realtors to save additional cost on infrastructure because of the future ready technology – VoIP. With the web based Remote Management feature, all the systems can be centrally managed by the IT administrators from anywhere through any device.